The next couple of weeks are shaping up to be some of the best of the year and unsurprisingly they involve eating copious amounts of Jamon Iberico. On Monday, I join my good chums at Brindisa for the launch of the new Dehesa, the latest release of Jamon Iberico de Bellota from the incomparable Joselito. A few days later, I fly to Seville and from there make my way to Badajoz, one of the spiritual homes of Jamon to spend some time with a producer discovering the secrets of creating the world’s single greatest item of food. By way of preparation and inspired by HP’s recent trips to Spain, I decided to make my own mini tapas crawl with visits to the two most recent additions to London’s seemingly endless production line of Spanish restaurants and tapas bars. The new branch of Pinchito is located on the corner of Bedford Square, just off Tottenham Court Road. It’s décor and approach will be instantly familiar to anyone who has visited their first branch near Old Street or the now defunct PinXto People in Brighton. The offering is as much about the impressive cocktails created by co-owner Toby Garcia, as it is about the food and Pinchito shies away from the traditional approach to tapas bars in favour the nuevo take of Cal Pep in Barcelona from which it draws its inspiration. A quick sampling of two staples shows that there is still work to be done in the kitchen. Rabas, that Cantabrian weekend favourite of squid, sliced thinly to look like tails (hence the name) and deep-fried was greasy, chewy and burdened with too fierce hit of paprika. Croquettes of “mixed meat” were better, well fried and with a dense filling, which would have gone perfectly with a glass of fino or a cocktail. The restaurant takes reservations and offers a wider menu of daily specials, but as with the branch in Old Street, I still think of Pinchito as an excellent bar that serves food rather than a restaurant, which does decent drinks. As the former, it is definitely worth a visit, as the latter it will need to up its game if it is to persuade people to linger. Barrica, on the other hand has set its stall out to compete full on with the West End’s other Spanish restaurants. Located on Goodge St. a few doors down from Salt Yard, and in the space once inhabited by ill fated and appallingly names, Ooze, Barrica is an independent operation (not as reported owned by Spanish group Vino Tinto) and traditional in its approach down to the three jamons swinging from the ceiling. There is an extensive wine list and a wide selection of pretty standard tapas. I chose two more dishes by which the intentions and abilities of any Spanish restaurant can be discerned. More croquetta of Jamon were tiny and had been cooked for too long on the outside turning from the pre-requisite golden to the point where they were just at the point of being burnt. The insides, however, were good, creamy and flecked with decent amounts of jamon, but far below what HP dubbed "The Croquetta D'oro" to be found at the three branches of Brindisa. Which brings us to the Jamon Iberico Bellota. The ham at Barrica had been cut by machine. Although the fat began to melt to a lovely sheen, as it should, it was not enough to disguise the fact that the meat had begun to dry out and lose the delicate flavour of acorns for which it is so famous. At £12 a plate, one probably could not have expected much more of a serving of this perniciously expensive product. However, one could and should expect better quality of storage and preparation for what is the benchmark of any Spanish restaurant with serious ambition. Some places to their credit (Vinoteca for example) have taken Jamon Iberico off the menu because they cannot sell enough at the price they need to charge to keep the product in peak condition. I suspect Barrica may come to the same conclusion not too far into their existence. It would be a good decision given the poor quality of the plate with which I was presented. Both Pinchito and Barrica have opened recently. However, both were charging full whack, so must feel that they were offering full value for money. I only sampled two dishes in each place, as much as I could manage and the very nature of a tapas crawl. I will probably head back to both to try more, but on this showing, Pinchito is looking the more likely prospect of the two, if mainly for the fact that Toby Garcia makes some of the best drinks in town. What both places really achieve however, is just making me long to be back in Spain. Soon come. A few days ago a parcel arrived from the P.R company of Charlie Bigham's. It is not normally the sort of thing we would accept unless it was as part of the goody bags we put together for Dine With Dos Hermanos, but I have to admit to being a fan of the company and, much more importantly, it contained pies. 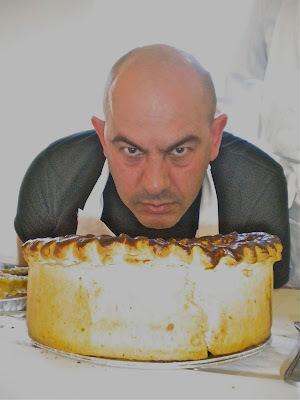 Just a word to anyone out there in PR world who wants something plugged shamelessly, on Dos Hermanos, mark your package "Handle with Caution, Contains Pies" and there is a very good chance that it will get a sympathetic hearing. 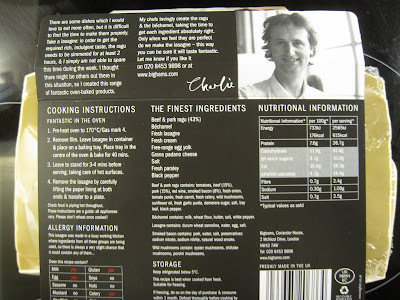 Charlie Bigham started his company in 1996 frustrated by the paucity of decent ready meals. The range is predicated on great ingredients and home style preparation. It is now available pretty readily through their links with Ocado and Waitrose. Our care package contained A couple of stews, some fish cakes, a lasagne and two beef & ale pies. The stews were banished to the freezer for later attention and the packaging of the fish pie had swollen alarmingly like a dead man floating in The Thames, so was consigned to the bin. Which left us with the lasagne and the pies. The lasagne was a miss. The layer of a meaty ragu was actually rather good, but the pasta gained raised eyebrows from both of us for actually being rather unpleasant. It had gone soft in the recommended cooking time and had taken on a taste which HP summed up as "slightly rank" I am pretty sure that this is not the effect they were looking for in the Charlie Bigham test kitchens, I am assuming something happened during shipping, but HP was right and after a couple of bites, it too was tossed into the bin with the bloated fish cake container. We turned our attention to the pies. 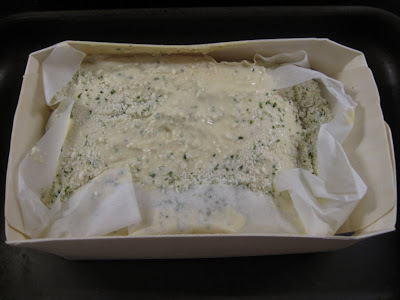 The certainly look the part, contained in weighty ceramic pots and topped with puff pastry. Thankfully, they also tasted the part when they emerged from the oven, golden brown and with the toppings inflated to a nice crisp. 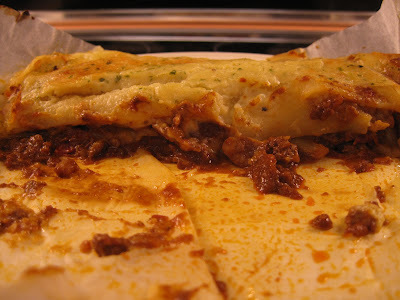 The filling of beef contains good chunks of meat (from Donald Russell, I think) and the sauce is deep and rich with a definite hit of Worcestershire. They were delicious in fact and with a handful of chips and some peas, the Beef & Ale pies make a very agreeable supper. I am not generally a fan of ready meals. For anyone who really loves food, the preparation of a meal is an end in itself not just a process to put food on the table. So, just slamming something from a packet in the oven, however decent, rather misses the point. 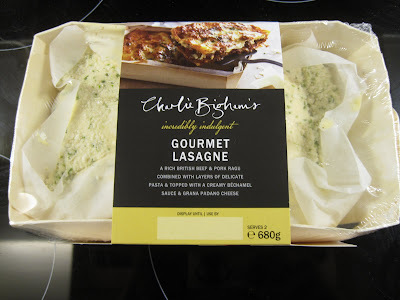 Having said that, on those days when lack of time and sloth combine to make standing in front of the oven a chore, you could do a lot worse than trying a pie from the Charlie Bigham range. In truth it’s probably not a good idea for me to visit Spain so often – it spoils me. After spending just a few days in whichever city or town is lucky enough to be graced by my presence, all the nonsense of the foodie world in the UK in general and London in particular seems very, very far away indeed. 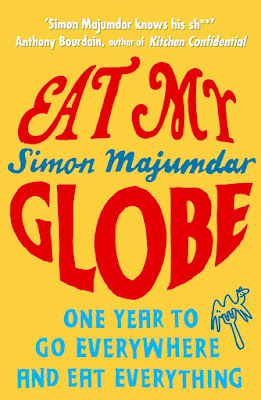 No tedious over-hyping of duff concept restaurants or the next big thing, no use of food as a weapon in the class war, no endless role-call of TV shows where celebrity chefs patronise natives of countries with far older and more interesting food cultures than their own and, most importantly of all, no Nigel Slater. No, in Spain all you get, if you ignore Mr Crisps (aka Ferran Adrià) and his acolytes is good food made with decent ingredients and maybe some bloke on TV making Tortilla or Empanada if you’re really lucky. 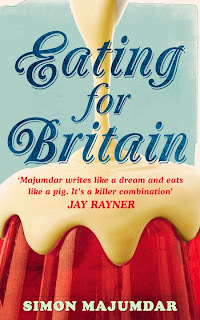 The idea of food as craft doesn’t really exist in the UK. 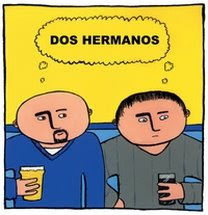 Dos Hermanos last experienced it at Angel Mangal. Each time we had our Special Mixed Kebab with a side order of Sweetbreads it was that little bit better than the last. 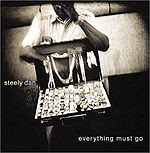 There was no need, thank God, to deconstruct or mess around with it. It was simply grilled meat, sure, but there was always a little extra care going into it. 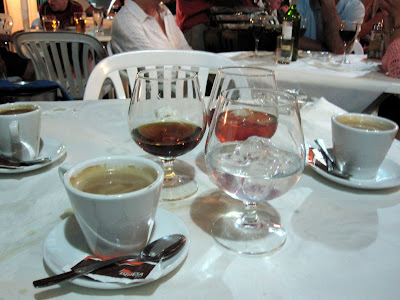 I was reminded of this when I visited the local bar/restaurant overlooking the Mediterranean that I always venture to at least once during a stay Fuengirola. There’s probably hundreds of similar places along the Costa but what they do, they do very well. If my most recent visit was anyything to go by they may have a new chef in - their grilling of fish was always spot on but this time the cooking was just that little bit better. The fish comes from local fisherman and is caught that morning. You choose from whatever they have in the chilled display cabinet and once it’s gone that’s it. Today there was, Rodaballo, Lubina, and Besugo. They also had a big tray of Calamaritos. After some Jamon that was cut so plenty of fat remained on the slices we got stuck into the seafood. Big plates of Boquerones and those Calarmaritos were followed by some fish simply grilled and dressed with oil and parsley. If you could eat like this every day of your life it wouldn’t be a hardship. The chips are usually a bit of an afterthought here but they were pretty good in the way that chips cooked in Olive Oil usually are. The following night we ate even closer to home. The local restaurant is a big draw for the expat community and has simple dishes at reasonable prices. DH padre had asked the chef/owner to get some seafood in for us. My father does that because he loves me (well, as he says, somebody has to). The shellfish was up there with some of the best I’d had in Spain. The freshness, the care in the preparation and presentation and the timing were all spot on and we enjoyed ourselves so much we were there for the best part of five hours. In the Spanish way several courses were served to share. Concha Fina Natural – large clams – where the meat is removed and replaced back in the shells retaining all the juicy, saline goodness. Fresh and briny, they didn’t last too long. Likewise Mejillones al vapour and some of the freshest Gambas cooked on the plancha I’ve eaten anywhere. Then a big plate of tiny, sweet Almejas cooked with plenty of olive oil, garlic and parsley with plenty of clam liquor to mop up afterwards. Feeling a little bit stuffed I was worried that a plate of Rabo De Toro was going to be too much but it was excellent: clean tasting and not over rich as this dish can sometimes be. Baba had huevos estrellados a dish beloved of Spaniards everywhere and if you’re wondering, yes it is egg and chips but you break and mix up the egg with the potatoes. The night was finished off with far too many Anis Secos and Pacharans. On the casa, of course. A visit to Malaga province is not complete, of course, without a visit to the city of Malaga itself. I’ve been visiting for a few years and the centre is always a bit of a building site which didn’t stop myself and the third Hermano doing a little tapas crawl (well, about three hours of crawling). Lots of highlights like Tortitas de Camarones and Berenjenas con miel and of course super fresh seafood. On my return to London I found people very excited because a Pizza restaurant has opened and there’s a new Canteen in Canary Wharf. Spain in general and Malaga in particular suddenly seemed very, very far away indeed. Sigh.